A night of Glory. 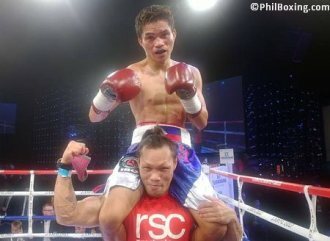 In a thrilling display of power, Filipino Rey Loreto impressively mauled and knocked out tough South African former world champion Nkosinathi Joyi to capture the vacant International Boxing Organization (IBO) Jr. Flyweight World Title tonight (Feb 1) at The Salle des Etoiles in Monte Carlo, Principality of Monaco. South African referee Andile Matika waved off all actions declaring the knock out at the 49 seconds mark in round 3, and Loreto reaching his boyhood dreams of world title glory. The 23-year-old Davaeño new world champion Rey Loreto, nicknamed “The Hitman,” improved his pro fighting record to 18 wins, 13 loses, with 10 wins by way of knock out, while the defeated Nkosinathi Joyi (the former IBF minimumweight world champion) came down to 24 wins only 3 loses with 17 knock outs. “We are so happy, we did it!! The South African was a dangerous experienced opponent. But I knew we could do win. 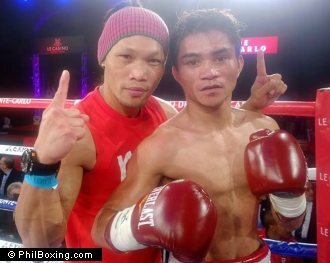 Loreto is new world champion,” shared his proud manager Brico Santig as Loreto's trainer, JJ Jorda, carried the Davao wonder kid on his shoulders in the ring of The Salle des Etoiles in sign of victory. “This world title is a triumph for all the Philippines, a victory of all,” said Santig. Click here to view a list of other articles written by Carlos Costa.